Soldierboy is a handsome black boy born on June 19, 2016. He is a sweet guy. He’s pretty low-key and may even seem aloof initially, but he warms up once he gets to know you. He’s actually very affectionate and enjoys attention, he’s just not pushy about it. He crates well. Soldierboy showed a fair amount of interest when cat-tested and should not be trusted with them at this time. If the behaviour is strongly and consistently discouraged, it may improve in time. Soldierboy interacted well with the other Greyhounds and responded well when meeting Jack Russell Terriers. Caution should always be exercised with smaller animals, especially outdoors. 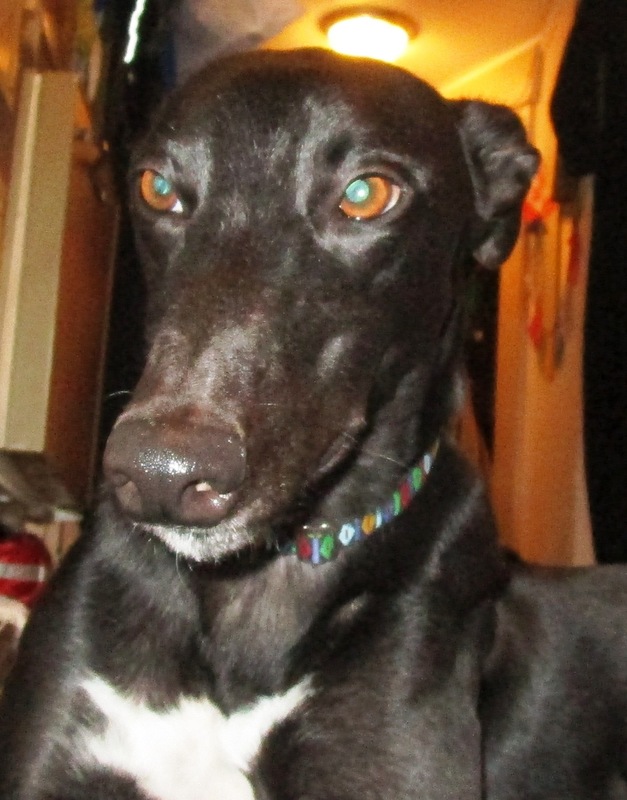 The foster family have already reported that he is not fond of kibble – he would rather eat what the resident Greyhound is eating…..and he will probably get his way! A good house guest, sleeping well through the night in the bedroom with foster-Dad and the other Greyhound. Very very curious about everything on his walks and wants to check out all things moving or not – did well meeting other dogs. 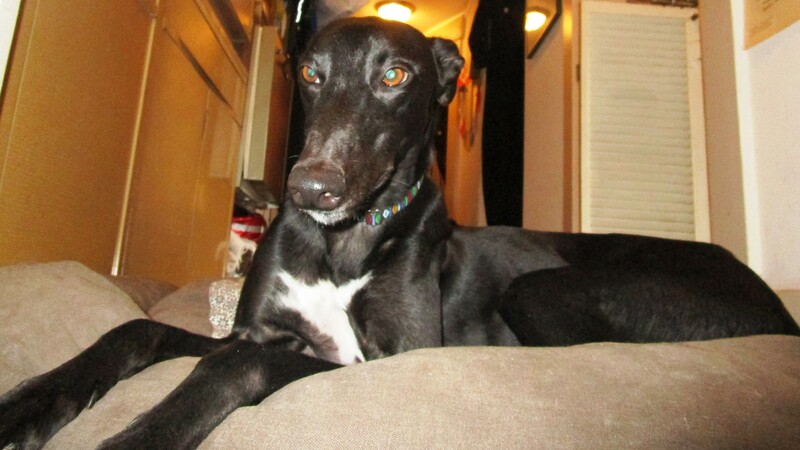 Flash has moved to another foster home and is enjoying the company of another very sweet resident Greyhound. He has a nice backyard to play in and has manged to go up and down the steep stairs after only a few moments hesitation. Flash ate a good breakfast after a good nights’ rest, only waking up once in his new surroundings. We will update again after he has settled in at his new foster home. Flash is doing great with his meals and finishes all the food I give him, eating twice a day. He is enjoying his kibble (now at one and a half cups) mixed with a small amount of canned soft dog food, rice, yogurt and warm water. I will continue to increase his kibble and decrease the rice and canned meat, until he is good with kibble alone. Also, he is finally now enjoying doggie cookies and treats! I was very Happy to see this! He is doing much better now getting down the back stairs that lead out to the yard. There is no more diarrhea at this time and his stools are becoming much more solid, so hopefully this will continue. Flash loves to go for our daily walks and does very well on a short leash walking by my side. We have been doing neighborhood walks, as I have not yet tried to get both Flash and Dolly in the back seat of my Nissan Micra. I am hoping to give it a try tomorrow to see how it goes. I will definitely be putting both of their muzzles on. If this works well then we can get out to the parks that I always have taken Dolly to. Flash is sleeping well and through the night on his bed, in my room with me and Dolly. I had my 5-year-old Grandson here for a sleepover on the weekend and all went well with Flash. with this. He is very Happy to see me when I come home! What a Sweetheart! The person or family that adopts this boy will be getting a Gem! He’s pretty special! Dolly is doing much better now with having Flash in our home. I think that it was hard for her at first, as she has always been the only dog here with me. Both dogs get along and both seem to like each other. Flash is doing very well; quite laid back and mellow for his young age of two. He is calm in the house and has good manners. He loves to play with resident Greyhound’s stuffies and he also will cuddle with them on his bed. He is a friendly and affectionate dog. He loves to go for walks and tends to stay close beside Foster while walking. He does have a little anxiety when it comes to loud unfamiliar sounds. For instance, there is a lot of construction in the neighborhood right now. He got scared yesterday when we were out with the sounds of nail guns, lawn mowers, and barking dogs. 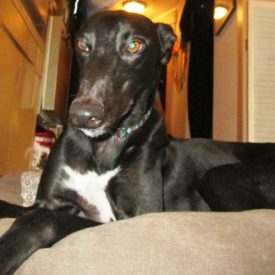 Flash is very fond of resident Greyhound, Dolly, and got along with all the dogs at PetSmart on Saturday; laying his head on their backs; it was very sweet. 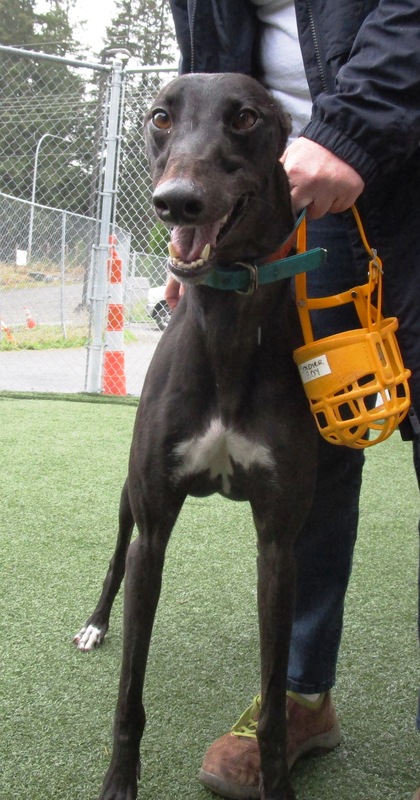 I think that Flash loves to be around other hounds but would do well in a home with just his people, if he gets enough attention, love, is not left alone for long periods of time and gets daily walks. 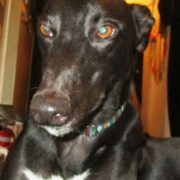 Walks with other hounds or any Greyhound activity would be nice for him, if his new family is willing. 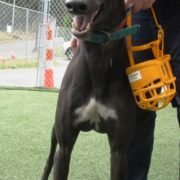 If his potential adopter could take him to work, it would be awesome. Flash crates very well and goes in whenever the Foster leaves the house. He stays quiet but gets quite excited upon their return. He has not been left for a full day since being in this Foster home. They were out for around 5 hours and he did well with that. The occupants in the basement suite said that Flash was quiet the whole time they were gone. The Foster thinks that Flash would do well living in a condo as he is not at all high energy and he has not heard him bark yet. He has the yard to use, but usually he just does his business and wants to come back in the house.